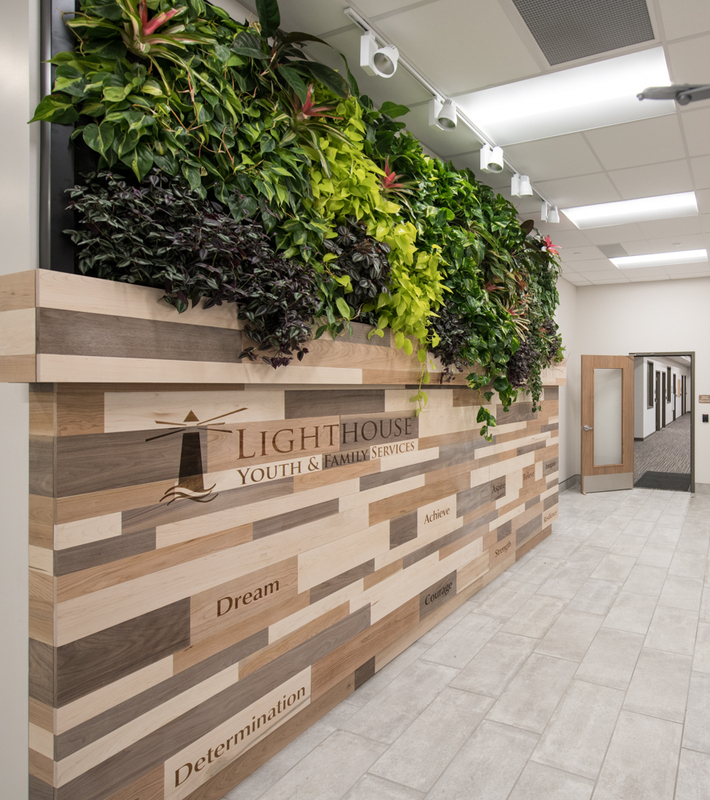 In the spring of 2016, C+R Architecture contacted us about an exciting opportunity to bring a Living Wall to the brand new Shakely Lighthouse Youth Center, whose mission is to end youth homelessness in Cincinnati by 2020. 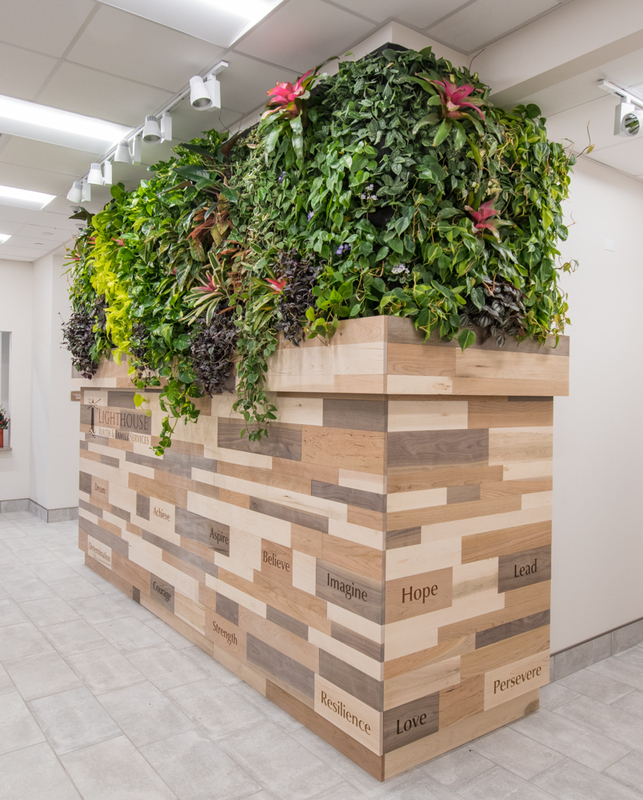 We decided on a 20 ft long by 4ft tall Living Wall, which wraps around a corner and is complimented by a motivational façade constructed from reclaimed wood.This wall features over 250 living plants from 12 tropical species. This project struck us as a unique opportunity to bring the soothing aesthetic of nature to something that will serve as a safe space for Cincinnati’s most troubled youth. Humans evolved as a part of nature for thousands of years. Over the past 300 years we have built incredible cities that brought about longer and more comfortable lives for many. Unfortunately, as a result of this development we have pushed nature away from the higher populated city centers. We now have large sections of the population that only experience nature on a daily basis through the form of a few potted plants on porches, while their bodies and minds evolved over millions of years to be surrounded by nature. While we may never fully recreate the immersive natural experience enjoyed by our ancestors, our Living Walls bring nature into urban spaces in an exciting way. 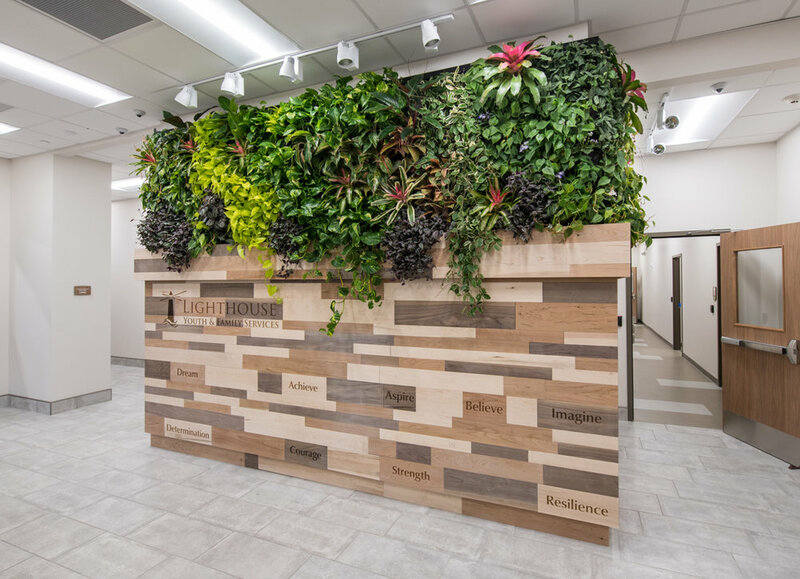 This installation along with our other Living Walls catches your eye as soon as you enter the space. Studies have shown that this is enough to improve one's mood, energy levels, and attentiveness for hours. We hope that these benefits to both the workers at the center and the kids staying there will improve the chances of success for the organization’s mission.